ManoMano, the leading European platform for DIY and gardening, has raised 110 million euros in a new funding round and has confirmed the company's 2020 ambition of achieving 1 billion euros in sales. ManoMano, the leading European platform for DIY and gardening, has raised 110 million euros in a new funding round and has confirmed the company’s 2020 ambition of achieving 1 billion euros in sales. Since its creation, ManoMano’s mission has been to empower individuals, professionals and retailers to make their own kind of world, freeing them from the traditional restrictions of DIY through a collaborative platform and innovative services. Worth a total of 365 billion euros in Europe, both the BtoC and BtoB DIY markets are amongst the last to adapt to the modern digital consumer. The leading European platform for DIY and gardening currently has over 20 million monthly visits with over 2.5 million active clients in 2018, twice the number registered in September 2017 when the company last raised funds. In 2018, ManoMano continued its growth with an 85% increase in sales. As the second biggest European DIY market, worth 27 billion euros, the UK is key for ManoMano. Our aim is for the UK to account for 25% of all sales, and results so far are encouraging as this is the fastest growing country with a 200% increase on sales since launch. ManoMano has raised 110 million euros in a new funding round. New entrants include Eurazeo Growth, Aglaé Ventures and Bpifrance, via its Growth Fund Large Venture, each confident in the strength of the platform’s model, in its innovation and in its growth potential in the B2B market. “It is with great enthusiasm that we are entering ManoMano's capital today. We have been following the company for more than 3 years and have witnessed its spectacular development in a very vast sector that has begun its digital transformation and where the experience of customers, individuals and professionals can be significantly improved." said Yann du Rusquec, Managing Director of Eurazeo Growth, an entity created by the merger between the Idinvest Growth and Eurazeo Croissance teams. ‘We are particularly impressed with what ManoMano has done and their capacity to constantly innovate to differentiate from competition. Bpifrance entered the capital in early 2016 with our Ambition Numérique Fund, to finance the business’s international expansion. Large Venture now enters to renew our trust in the team and support them in their commercial development, including their new logistical service and BtoB offer, whilst maintaining efforts in R & D. We’re convinced ManoMano has the potential to become the worldwide leader for its market and this is the reason we have chosen to strengthen our capital investment.” state Maïlys Ferrère, director of equity Large Venture and Xavier Deleplace, deputy director of the Digital Pole at Bpifrance. With innovation playing a key role in ManoMano’s success to date, the platform wishes to go well beyond end customer satisfaction. With the will to ensure its partner sellers flourish in the French and European market, the business offers powerful logistical services in France (dedicated fulfillment platform launched in November 2018) and innovative services to support their activity (billing service, sales optimisation tools, market data…). Their most recent strategic choice was the launch of ManoManoPro in March 2019, a platform dedicated to professionals. The business aims to disrupt the way building professionals purchase their materials, attacking a market worth 200 billion euros in Europe. The industry is one of the last to make the move to the online space and ManoMano intends to become its leader. To remain at the forefront of innovation and stay one step ahead, ManoMano will recruit the best tech talent in Europe. In 2019, one hundred developers, data scientists and data engineers will join the teams in Paris, Bordeaux and Barcelona. « Our ambition is to truly transform the way we do e-commerce in our industry. To do so, we must have the best tech teams in Europe. 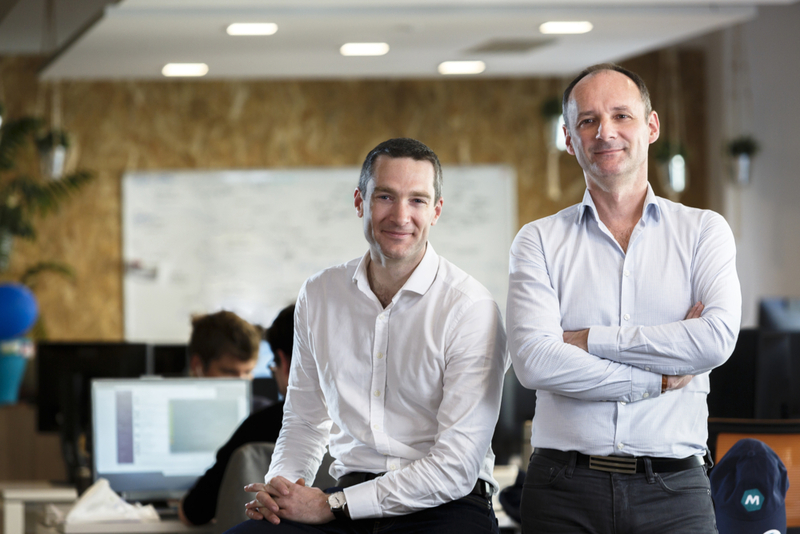 Our pro-European, company is the ideal place for tech talents to imagine the new face of e-commerce and enjoy daily challenges.” explain Philippe de Chanville and Christian Raisson, founders of ManoMano. Today’s announcement will enable ManoMano to continue its conquest of Europe, with five countries outside of France already representing 25% of its business volume. These countries saw three-digit growth in 2018. Today, ManoMano aims for its foreign markets to follow in the footsteps of their French counterpart, with a focus on international customer acquisition in Italy and Spain, while increasing seller catalogues in both the UK and Germany. A European company at heart, ManoMano plans to support the growth of its European merchants, outside their home country, with a goal of 200 to 300 million euros in sales by 2020. “To compete with Chinese and American e-commerce giants, our international development is essential. The funds raised will enable us to upscale our presence in Europe and continue to disrupt the DIY industry, while still guaranteeing a first class customer experience.” explain the founders of ManoMano. Launched in 2013, Manomano is the leading European marketplace for DIY and gardening. Co-founded by Philippe de Chanville and Christian Raisson, ManoMano works with over 1800 sellers, and brings together the largest offer of DIY products online with over 3 million DIY products: electricity, plumbing, hardware, frames, indoor and outdoor furniture, tools etc. ManoMano has a workforce of 370 and operates in 6 countries (France, Belgium, Spain, Italy, Germany and Uk). Download pictures and photos of the cofonders, the team and the products of ManoMano here. Partech is a global investment firm with offices in San Francisco, Paris, Berlin and Dakar. We bring together capital, operational experience and strategic support for entrepreneurs at seed, venture and growth stages across multiple continents, with over €1.3B investment capacity. Investments range from $200K to $50M in a wide range of technologies and businesses for enterprises and consumers, from software, digital brands and services, to hardware and deep tech across all major industries. Companies backed by Partech have completed more than 20 initial public offerings and more than 50 strategic exits above $100M. Eurazeo is a leading global investment company, with a diversified portfolio of €17 billion in assets under management, including nearly €11 billion from third parties, invested in over 300 companies. With its considerable private equity, venture capital, real estate, private debt and fund of funds expertise, Eurazeo accompanies companies of all sizes, supporting their development through the commitment of its 235 professionals and by offering deep sector expertise, a gateway to global markets, and a responsible and stable foothold for transformational growth. Its solid institutional and family shareholder base, robust financial structure free of structural debt, and flexible investment horizon enable Eurazeo to support its companies over the long term. Eurazeo has offices in Paris, New York, Sao Paulo, Buenos Aires, Shanghai, London, Luxembourg, Frankfurt and Madrid. BPI france finances companies - at each stage of their development - in credit, guarantees and equity. Bpifrance supports them in their innovation projects and internationally. Bpifrance also provides their export activity through a wide range of products. Consulting, university, networking and acceleration programme for start-ups, SMEs and ETIs are part of the offer for entrepreneurs. Thanks to Bpifrance and its 48 regional offices, entrepreneurs benefit from a close, unique and efficient contact person to help them face their challenges. The Digital Ambition Fund is the investment fund dedicated to start-ups in the digital domain, launched by the French government as part of the Programme d'Investissements d'Avenir (PIA), subscribed to by Caisse des Dépôts and managed by Bpifrance Investissement. This fund co-invests in start-ups with strong growth potential, developing new technologies, uses and services in the digital economy. The €1 billion Large Venture fund has invested since 2013 in 37 companies in priority sectors such as health, digital and environment with high capital requirements. Large Venture is a minority investor active in the governance of companies already financed by VCs or having significant revenues. Capable of investing amounts in excess of €10 million, Large Venture provides the equity financing continuum for innovation capital players who are involved earlier in the company's development.